For 1989, a full convertible version of the Jaguar XJ-S finally became available after five years of the little-loved targa convertible. The power top, which could go up and down in as little as 12 seconds, was padded, lined, and included a heated glass rear window. 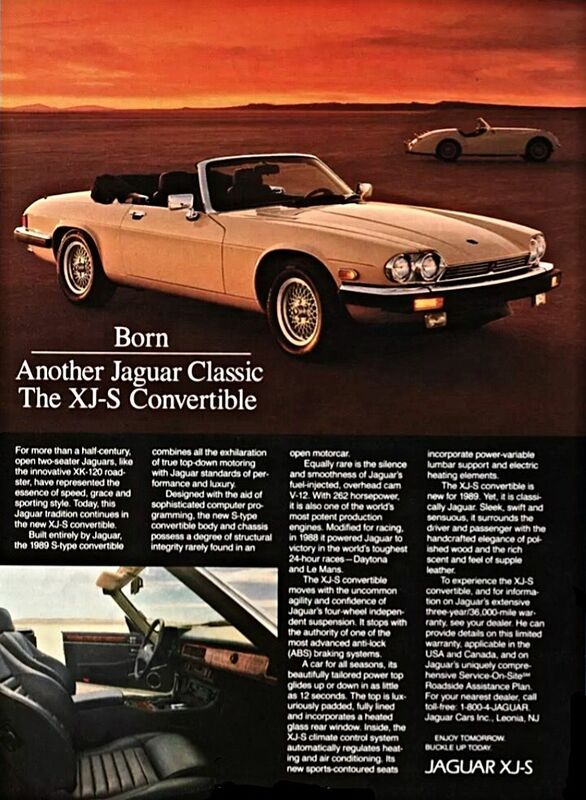 1989 Jaguar XJ-S convertible advertisement. The only powertrain available for any XJ-S continued to be the 262 bhp H.E. 5.3 liter/326 ci V12 with Lucas-Bosch fuel injection paired with a three-speed automatic transmission sourced from General Motors (a powertrain that had been around since 1982). Performance was respectable for the almost 4,200-pound convertible: 0-60 mph in a little under 10 seconds. Mileage remained what you might expect from a thirsty V12—12 city/16 highway by the standards of the day (11/15 by today’s standards). With a 10% fuel reserve, an XJ-S owner could expect a range of between 250 and 275 miles. Standard equipment on the $56,000 car (about $116,700 in today’s dollars) included a four-wheel independent suspension, power steering, and four-wheel anti-lock power disc brakes. 15-inch alloy wheels were paired with Pirelli P600 235/60VR15 tires—which are still available! Inside, the buyer received air conditioning with automatic temperature control, power windows, heated power mirrors, power door locks, intermittent windshield wipers, cruise control, and an AM/FM stereo cassette with Dolby and metal tape capability. New sport-contoured seats featured power-variable lumbar support and electric heating elements. The Jaguar XJ-S has good club support, and there are some restoration parts available. There’s also a free 738 page (!) ebook written by an XJ-S owner named Kirby Palm available with much hard-earned advice. Keeping an XJ-S at 100% is non-trivial—as it is with so many high-end eighties cars. Like all Jaguars, XJ-S convertibles have a following and make frequent appearances in the Hemming’s Motor News classifieds and eBay. According to Hagerty’s valuation tools, all the money for a 1989 XJ-S convertible in #1/Concours condition is $31,000, with a far more typical #3/Good car going for $14,100. As I write this in June 2018, a white 1989 XJ-S with 70,000 miles is for sale for $15,000. Make mine British Racing Green, please. ← 1981: What Cars Are Collectible?